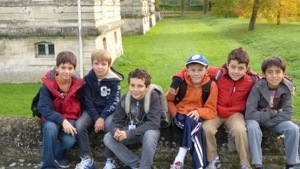 We had a great day at the Château de Blérancourt on Friday, October 19th. We met at the Mairie (or Town Hall) in Blérancourt. We all sat around the table in the Salle des Mariages to have a Conseil Général lead by Philippe to discuss our stay so far. All of the children said they are having a very good time. After checking in, we headed over to the Musée de Blérancourt au Château de Blérancourt where we were met by Catherine. She explained some of the history of the château, and we discussed the "masks" on the walls of the château. There were some terrifying faces, and she explained how they were put there to frighten away evil spirits. She showed the children several examples of these masks in order to inspire them for the workshop that followed. She explained that they would be making their own using only things found in nature. We went to the gardens after, and as the flowers are coming to the end of their season, the children were allowed to take any of them for their masks. They collected leaves, flowers, pebbles, and other things to use for their masks. We then went to the field where we did our workshop. The children put on plastic garbage bags as smocks and went into the arboretum to collect more leaves, nuts, and things for their masks. When they returned, each one was given a large piece of clay and a shared bucket of water. They worked their clay and then when it was flat enough, they each went to the tree where they would make their mask. It was wonderful to see our little artists hard at work. Each one had a tree as his/her easel, and they were running back and forth joyfully finding the perfect tool or leaf to complete their masterpiece. All of the masks were incredibly different, and I loved seeing the different personality of each student as they decided what kind of mask they wanted to create. Some were terrifying, some were joyful, and some were silly, and each one was unique. 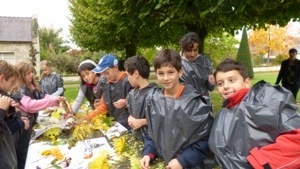 The children each had a picture taken with their creation as this was an ephemeral creation that cannot be taken home. At noon, the children went home for lunch with their host families. What a treat to have almost two hours at home for lunch! In the afternoon, we returned to the Château where we were met by Madame Dopfer, the conservator of the museum, for our afternoon visit and workshop. We learned more about the history of the château and the ruins that were found underground while remodeling the museum. Work has been stopped for several years in order to preserve these discoveries, and they will become part of the museum exhibit when it reopens. We visited the north pavilion that is now restored as the guest house just like Anne Morgan had it set for her visits to help the civilians of the region between the two World Wars. We learned about the restoration of the furniture, the tapestry on the wall, and the building. We then went to the library in the south pavilion. It is a library filled with books on Franco-American relations. Madame Dopfer spoke about how books evolved over time and about an Ex Libris used to label a book from a specific person's library. 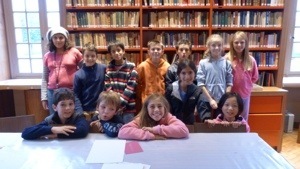 We had a fun workshop where the children used stamps and markers to make their own Ex Libris. Those who finished early had time to make a bookmark as well. We ended our day with a snack at the museum's reception office. We were excited that Patricia Colin arrived safe and sound to join us despite her plane's delay.